A few days ago I talked to one of my best friends in Mérida, Venezuela. Jose, a former Chavista who, like most of the Chavistas I knew when I lived in that city, is now in opposition to the Bolivarian government without being in “the Opposition.” He’s quite clear the Bolivarian process was a failure, but he’s not sure the Opposition or the United Democratic Roundtable (MUD) is going to be able to do much better. Still, he also finds it a hopeful sign that three-quarters of Venezuela’s voters turned out December 6 last year to vote 2-1 to bring the opposition to power in the National Assembly. I’m not so optimistic, given what I’ve seen of the ways Maduro and the Chavistas he directs are attempting to undermine the National Assembly and subvert the will of the people. I’ve been trying to convince Jose to leave the country for Colombia since his wife is a dual citizen and they could easily settle into the neighboring country and return home one day when, or if, things get better. Jose no longer needs convincing after his son’s recent experiences. In one of the most dangerous countries in the world, how is the government proposing to deal with the situation? One would think that gang rule emerging all over the country would threaten the state’s “monopoly on violence,” but evidently the Bolivarian government isn’t in principle opposed to co-governance—as long as it doesn’t have to rule with the MUD coalition that a majority now favor. Sharing the government with gangsters, however inconvenient it might be, can work out as long as you know you have upper hand and can go in and kill the paramilitaries that step out of line, or who “know too much.” The example of Jose Odreman and other members of the March 5th Collective serves as a lesson to all and as a case in point. 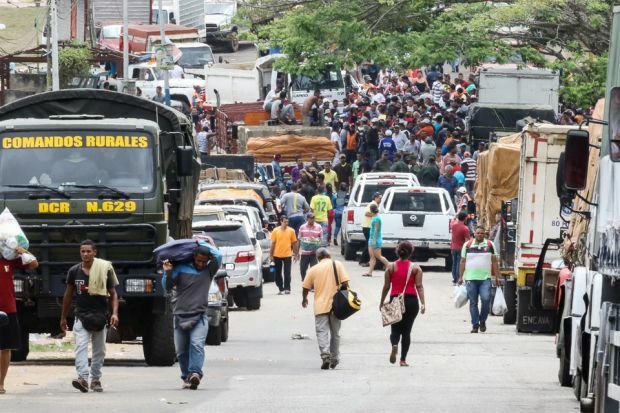 The policy of governing with paramilitaries and gangs seems to be working so well at keeping the people in line, as it were, that new “Mega-gangs” are taking over entire regions of the country and it appears the Ministry of Defense now wants to arm them. According to a February 5, 2016 document written by Bolivarian Minister of Defense Vladimir Padrino López and leaked to the press, the Ministry of Defense plans to turn over even more arms this year to the very people who robbed Jose’s son the other day. This is another very disturbing step in the militarization of Venezuela that goes against the overwhelming tendency of Latin America over the past twenty-five and more years to demilitarize. Venezuela has had only some forty years of civilian rule (1958-1998) since its founding, with a total of 140 years of military rule, depending on what you reckon the Bolivarian government to be. The late President Hugo Chávez was himself military, and during his time in office he placed 1614 active and retired military officers in high levels of government(governorships, ministries, parliament, embassies, etc.). Maduro, since taking over, has added some 368 or more military in the government. Maduro has also increased the military’s economic power significantly, allowing them to form eleven corporations in mining the nation’s extraordinary mineral wealth (including, recently, oil and gas) in companies without any civilian oversight or transparency. In other words, the demise of liberal democracy in Venezuela has coincided with the rise and return of the military to power. In a tacit deal to prop up an extremely weak President Maduro, the military is increasingly taking control of the economy, including oil and other mineral wealth in the country. The deal appears to be that the military will protect the president and his coterie, and the gangs will provide backup to the military to protect it from… the people. This has resulted in an unparalleled militarization of Venezuelan society with grave and unforeseen consequences for the future. Today the Bolivarian government has only one real enemy left and that’s the people of Venezuela. According to a recent poll, 72% want Maduro thrown out of the presidency before his term ends in 2019, and the military is backed by only 2–6% of the population. By contrast, the ultimate representative of the “capitalist-imperialist fascist ultra-derechista oligarchy” Polar Industries, Inc. led by Lorenzo Mendoza, the man Maduro most loves to insult, receives a 92% approval rating from Venezuelans. We don’t have to agree with that perspective to understand why Venezuelans have widely come to respect one of the last functional corporations efficiently and consistently producing food for the country while under duress (threats from Maduro, ongoing arbitrary expropriations, etc.) when the government has failed so miserably to do that much. Certainly seventeen years is enough time for Venezuelans to see the difference. What do Bolivarian supporters think will be done with all those guns? Who will disarm the gangs growing all over Venezuela if the state collapses? Can we support a project that spends its money on the military and paying off Wall Street bondholders when the people are without food? How much worse does it have to get before solidarity activists around the world catch on to what’s happening in Venezuela and start supporting the people, who want to be done with the Bolivarians? What will those activists have to say for themselves when they can’t avoid the failure of Chávez’s project any longer? Will they just pretend like nothing ever happened, as many of those earlier leftists did who refused to criticize a “left” government in Cambodia and ended up defending Pol Pot? Interesting. I'm not following Venezuela that much anymore; I had no idea it had turned this bad. One would think that gang rule emerging all over the country would threaten the state’s “monopoly on violence", ...“Mega-gangs” are taking over entire regions of the country and it appears the Ministry of Defense now wants to arm them. Gangs are a part of the state. They serve the interests of capital and protect capitalist law and order. "Who will disarm the gangs growing all over Venezuela if the state collapses?" What kind of gans are we talking about? Are these people kind of an ex-prisoner type or elements of lumpen proletariat ? And what is their political afiiliation? Can we call them as püre fascists or some kind of left sympetazers? Sorry, but this is just wrong. Criminal gangs are part of capital, just like businesses. However they are not inherently "part of the state" (although of course in many areas they have links with or are merged with parts of the state). Also what do you mean by "capitalist law and order"? Because depending on your definition of that, that's also nonsense. Capitalist governments spend large amounts of money fighting gangs: who are basically rival capitalists. They do disrupt "law and order", although of course they do not threaten the basic nature of capitalist society: private ownership of the means of production. They are just rival potential owners. Steven, by serving 'the interests of capital' I meant that Gangs add value to capital and hence serve it's interests. Gangs are just businesses that exist to make profits and that require a force of violence to achieve these ends. In a sense, I suppose they are state and capital combined. The forces of order are not orderly, they create disorder through their use of violence. The police pay informants thus these informants become one wing of the state. The police are the largest traders in illegal drugs so how can we separate Gangs from the police, the state. I don't think I'm writing nonsense by widening the goalposts of how we define the state. What I write above describes the reactionary role of Gangs and makes no mention of the revolutionary role Gangs (gangster, police and army) potentially play if defeatism takes hold in their ranks; and it does.